Writer and author, James C. Thompson, has written extensively on the social-networking relationships between Thomas Jefferson and many of the movers and shakers of the French Enlightenment, people with whom Jefferson became familiar during the period of his Paris years, 1784-1789. Yet one significant mover and shaker Thomas Jefferson never had the pleasure of meeting was François-Marie Arouet, known better to the world as Voltaire. Unfortunately, Voltaire had passed away in 1778, six years before Jefferson arrived in Paris. Even so, history leaves us hints that the contours of much of Jefferson’s thinking might have been influenced profoundly by Voltaire. François-Marie Arouet (Voltaire) was born in Paris, France on 21 November 1694. He passed away at age 84 on 30 May 1778. Adopting the nom de plume, “Voltaire,” he became the greatest intellectual influence of the 18th century French Enlightenment, the le Siècle des Lumières—the “century of lights,” or “age of illumination.” Noted for his profound wit and polemical satire, Voltaire was the author of poetry, dramas, essays, historical works, and perhaps most significant, the Philosophical Tale, the most famous being the novella, Candide (1759). In his Philosophical Tales, Voltaire critiqued many of the beliefs and institutions of his day through use of metaphor, veiled satire, and double entendre. Voltaire was also noted as a promoter of the sciences, particularly the scientific ideas of the Englishmen Isaac Newton (physics) and Francis Bacon (scientific method). To promote Baconian-Newtonian thinking among the general population, Voltaire worked closely with another great thinker of the day, Gabrielle Émilie Le Tonnelier de Breteuil, the Marquise Du Châtelet (1706-1749). While living together at the Châtelet estate in Cirey, France (1735-1749), Voltaire and “the divine Émilie” helped popularize the Newtonian-Baconian science of the day. The other half of the intellectual connection was of course Thomas Jefferson. He was also a student of, and contributor to, the 18th century Enlightenment, the Age of Reason. His formative years and his formal educational experiences occurred during that period. His views and values were greatly influenced by what he experienced in that era, by the education he received, the people with whom he became acquainted, and the events he witnessed. Of note, Jefferson was directly exposed to the American, Anglo-Scottish, and French Enlightenments. He helped shape the American Enlightenment while contributing at least indirectly to the later period of the French Enlightenment. Beginning in 1760, Thomas Jefferson attended the College of William and Mary in Williamsburg, Virginia. There he studied under Professor William Small (1734-1775), a proponent of Enlightenment thought, particularly in the areas of science, mathematics, and philosophy. It was at William and Mary and under the direction of Small where Jefferson was probably first exposed to the Enlightenment ideas of the English empiricists, namely John Locke, Francis Bacon, and Isaac Newton. Small also introduced Jefferson to the Scottish philosophers, Adam Smith and David Hume, and to the French philosophes, including Voltaire. During his years in Paris as the United States Ambassador Plenipotentiary to the Court of Louis XVI (1784-1789), Jefferson was exposed further to the ideas of the French Enlightenment. He received this exposure through direct contact with the philosophes, both in private settings and in the salons of Paris. Salons were highly popular in France in the 18th century. Essentially social gatherings of the upper classes, salons were focal points for presentations and discussions on various topics. The philosophes, philosophers of the French Enlightenment known for knowledge, profound analytical acumen, sagacity, and often wit, frequented these salons. Generally, they were renown experts in certain fields of inquiry that included political theory, economics, natural science, and so forth. By far, the philosophe who enjoyed the greatest reputation—even becoming a kind of metaphor for the times—was Voltaire. As mentioned, by the time Thomas Jefferson was in Paris (1785-1789), Voltaire had been dead for several years. Yet his intellectual reputation and profound influence had survived his death, and Jefferson met Voltaire vicariously in the Salons of Paris, through the vast written legacy generated by him, and though contact with those whom Voltaire had influenced directly. One significant hint at an intellectual connection between Jefferson and Voltaire, beyond the former’s schooling and association with Parisian salons, can be found in Jefferson’s private libraries. Thomas Jefferson owned copies of many of Voltaire’s published works, and his Voltairean holdings were in fact quite extensive. Most of these works were kept among the approximately 7,000 books that made up Jefferson’s private library at Monticello. Others works were part of a smaller private library of approximately 1,000 books, maintained at Jefferson’s retreat home of Poplar Forest, near Lynchburg, Virginia. An Essay on Crimes & Punishments [by Cesare Beccaria], translated from Italian, with commentary attributed to Voltaire (translated from French). TJ’s copy produced in 1809. Candide, ou L’optimisme (English title translation: Candide, or Optimism). TJ’s copy produced in 1780. Histoire de I’empire de Russie sous Pierre le Grand (English title translation: History of the Russian Empire Under Peter the Great). TJ’s copy produced in 1809. For sure, this extensive private collection provides subtle yet prime-facie evidence of the intellectual influence of Voltaire on the life of Thomas Jefferson. Voltaire’s influence on Jefferson can also be seen in his works Jefferson recommended to his friends and acquaintances. As example, in 1785 Jefferson provided to Walker Maury a list of books that included a reference to Voltaire. Ses ouvrages historiques (Translation: Voltaire, his historical works.) In a letter to Richard Mentor Johnson, dated 10 March 1808, Jefferson recommended again Voltaire’s historical works as good history worth reading and reflecting upon. Overall, Voltairean influence on Thomas Jefferson can be seen—albeit somewhat subtly—in the former’s works present in Jefferson’s libraries, in Jefferson’s private letters that reference these works, and in Jefferson’s stated admiration for the same three Enlightenment thinkers that so moved Voltaire. Moreover, the nature of the philosophies that Voltaire himself embraced, developed and promoted, including ideas regarding religious liberty, philosophy—particularly skeptical empiricism, the concept of separation of church and state, belief in God based on reason, particularly as understood from the standpoint of 18th century positive deism, the application of systematic reason, and the falsifiability and testability inherent in modern science, are to be found in the ideals and ideas of the Sage of Monticello, shaped in many ways perhaps by le patriarche, the patriarch of the French Enlightenment—Voltaire. Finally, in perhaps the greatest testimony that this is most certainly true, visitor’s to Monticello in Jefferson’s day were greeted in the Entrance Hall by the bust of Voltaire, a copy of the bust created originally by the French artist, Jean-Antoine Houdon (1741-1828). Thus, Voltaire occupied a high and noble space in Jefferson’s implied pantheon of heroes. The bust can be seen there still by visitors today. For sure, both helped shape the modern world. Dave Dietrich served for over forty years as a professional national security analyst and educator at the international, national, and military service levels. Since his retirement, he has been working both as an Assistant Professor of Political Science and as a volunteer docent at a Thomas Jefferson historical site. He is also a director for the Thomas Jefferson Heritage Society (TJHS). He is also the author of serval TJHS articles on Thomas Jefferson, including: Dissing Thomas: An Apologia (2017); Thomas Jefferson and Abigail Adams: A Singular Correspondence (2018); and Thomas Jefferson and the Enlightenment (2018). The author acknowledges with gratitude the advisory and research contributions that Anna Berkes (Thomas Jefferson’s Monticello), Endrina Tay (Jefferson Library, Thomas Jefferson’s Monticello), Rachel Honchul (Programs and Education Coordinator at Poplar Forest), and Travis McDonald (Director of Architectural Restoration at Poplar Forest) made to this article. Jefferson did refer to Voltaire in his book, Notes on the State of Virginia, Query VI, but about Voltaire’s thought regarding the origins of animal shells. See Jefferson, Notes on the State of Virginia, Query VI, A Notice of the Mines and Other Subterraneous Riches; its Trees, Plants Fruits, &C., 1785. Jefferson was also influenced by Montesquieu. Positive deism was the belief that God’s existence and moral laws could be known through nature. Positive deism was opposed by critical deism, which was a denial of any supernatural knowledge. Hero of the American Revolution. Tadeusz Andrzej Bonawentura Kościuszko, now little mentioned in American history books, was a hero of the Revolutionary war and of the Polish resistance to Russia. Born in 1746, he was first educated in Poland, and then went to France for military and engineering training. He began his military education in Warsaw, and then went to Paris to study military and civil architecture. After he returned to Warsaw, he fell in love with the daughter of a general, who objected greatly with a Kościuszko‘s attempts to elope with her. To avoid further confrontation with the father, Kościuszko fled to Paris and then America arriving in 1774. Once there, he joined the American cause, helping to plan the fortifications in Philadelphia. He was promoted to the rank of engineer colonel as a reward for his service, and sent to Fort Ticonderoga in New York. He designed and supervised the fortifications along the Hudson River which were instrumental in the defeat of General Burgoyne’s British forces at Saratoga. As a result, he was given the important assignment to design the defense plans and fortifications for West Point. The traitor Benedict Arnold agreed to aid the British in the capture of West Point by providing plans of the Kościuszko fortifications. He delivered these to a British Army officer John Andre, who was captured by sentries trying to slip through the American lines. Arnold escaped but Andre was hanged. In 1780, Kościuszko was promoted chief of the Engineering Corps and spent the next two years in the Carolinas. When the war ended he was made an American citizen and promoted to Brigadier General. He returned to Poland, but because of his earlier dispute, he was unable to secure a commission in the Polish Army. It was during this period he took a positive action against slavery, freeing the serfs from their obligation to him. His former love had become the wife of a prince in the powerful Lubomirski family and she was able to secure a commission for him as a general major. In the ensuing war against Russia, he rose to the rank of lieutenant general, but then suffered a great defeat and was taken prisoner. Upon the death of Catherine the Great, they released him in 1796 and he returned to the United States. According to the account by Margaret Bayard Smith, before he left, the Emperor presented him with a fur coat, which he later gave to Jefferson, who wore it for the famous full-length painting by Thomas Sully which hangs in the US Military Academy at West Point. He was received as a hero in the United States, and became close friends with Thomas Jefferson, then the vice president. He stayed for about ten months, but before he returned to Poland, he set aside some of his estate in a 1798 will executed in Philadelphia to emancipate slaves in America and named Jefferson to administer his plan (Kościuszko to Jefferson 9-15-1817). But a later will was then found which Kościuszko executed shortly before his death in 1817 leaving his estate to his niece. 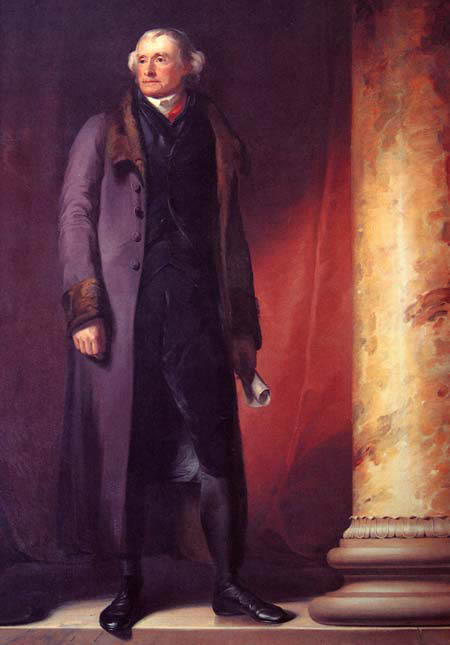 Jefferson at West Point by Thomas Sully. Jefferson pointed out the impediments to the bequest with Kościuszko’s residence in one country, his property in another, and his executor (Jefferson) in a third. In addition to the nieces claim under the 1817 will, Kościuszko’s two sisters also laid claim to the estate, as well as two other claimants. Jefferson realized that the legal dispute would outlive him and resigned. Kościuszko returned to France in 1698 and lived out his remaining years in retirement. He loved to tell stories about his adventurous life. After his death in 1817, he was buried in the cathedral at Kraków. Thus, since TJ drew upon not just Locke but the collective wisdom of the ages, perhaps he had in mind Aristotle’s understanding of happiness as eudaimonia, essentially moral, virtuous, and intellectual flourishing to achieve the ultimate good. [vii] As a self-avowed follower of Epicurus (b. 341 BC-d. 270 BC), TJ may have understood happiness also as involving avoidance of pain. [viii] [ix] But there is perhaps another, deeper and much more subtle possible explanation, one that certainly does not obviate any influences of Aristotle, Epicurus, and others. TJ may have had in mind ultimately the institution of slavery. Again, consider John Locke. Had the more Lockean term, ‘property,’ been used in the Declaration, then an argument possibly could have been advanced that slavery was a fundamental property right—a natural right coming from God. Moreover, unfortunately enslaved persons were looked upon as chattel property in TJ’s time, further making that argument a possibility, if not an inevitability. Yet, by using instead the phrase, pursuit of happiness while applying it to all, that argument could no longer be made as easily. A seminal ideal of government had been set. With the Declaration, all people were now acknowledged to have a God-given right to pursue the ultimate good (happiness), growing morally, virtuously, and intellectually in the process, while avoiding extreme, self-serving pleasures that often lead to pain (spiritual and physical). All Declaration signers were at least tacitly acknowledging that to be so, wittingly or otherwise. Many Americans are probably unaware of those original Jefferson words in the Declaration. Thus, TJ not only acknowledged that enslaved persons from sub-Saharan Africa were human beings, but they also were men (generic) endowed with the same natural rights as anyone else. King George III had denied them those rights (life, liberty, etc. ), reasoned Jefferson. What TJ may have done then was cleverly set the stage for the eventual final elimination of an unjust, inhuman, and tragic practice—the institution of slavery. [xiii] Still, he remains an object of derision and opprobrium in the minds of many. In our so-called post-modern era, where deconstructionism apparently has become a favorite analytical tool and method of inquiry for so many scholars, TJ is often portrayed as a kind of hypocritical person, perceiving liberty as something limited to privileged, white male landed gentry, and the like. Yet the historical evidence arguably points to a much different Thomas Jefferson, a person not only far ahead of his time, but a Framer that understood clearly that liberty applies to all persons, in all places and in all times, to which the laws of nature and of nature’s god entitle them. [i] Benjamin Franklin (Pennsylvania), John Adams (Massachusetts), Roger Sherman (Connecticut), and Robert Livingston (New York) were the other authors. [ii] John Locke, Two Treatises of Government (London: Amen-Corner Publisher) 1690, written in 1689. 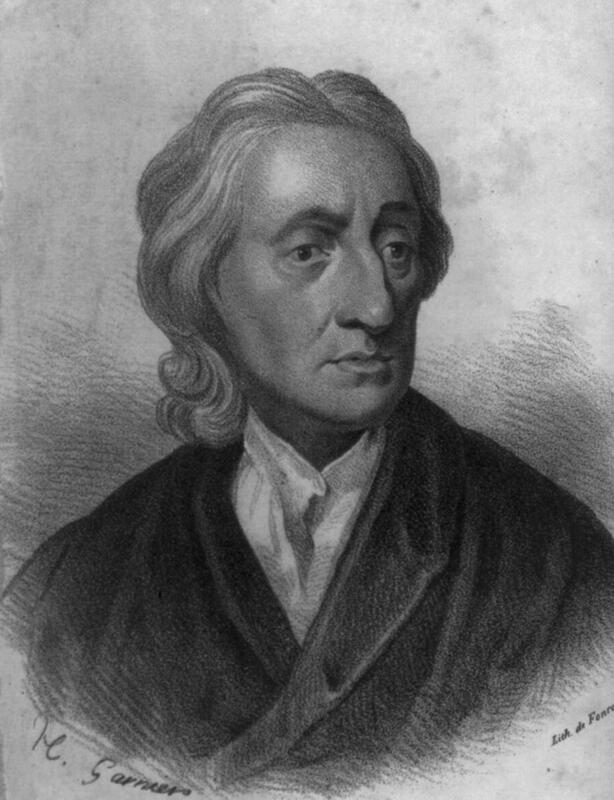 Note: Image of John Locke is public domain. [vii] See also Aristotle’s Nicomachean Ethics. [viii] Epicurus taught that the highest pleasure was derived from intellectual pursuits while avoiding extreme pleasures that often lead to pain (spiritual and physical). [ix] TJ consider himself to be an Epicurean. See TJ’s letter to William Short, dated 31 October 1819. [x] In a letter to James Madison, TJ claimed Franklin and Adams made changes to the final draft presented to Congress, but those changes were limited to a few incidental alterations. See TJ’s letter to James Madison, 1823. [xi] Delegates from certain colonies, such as South Carolina and Georgia, refused to sign the document unless all references to slavery were taken out. When we reflect back on Jefferson’s life, we tend to focus on his association with the American Revolution, particularly as principal author of the Declaration of Independence. We may consider his monumental role in opening up the West (e.g. The Louisiana Purchase), as well as his time spent in various positions in government, including as two-term president of the United States. What we may under appreciate, however, are the influences the 18th century Enlightenment had on his beliefs, actions, and even his character. In the “dining room” of Thomas Jefferson’s retreat home of Poplar Forest, located in Forest, Virginia, there are features that seem to track nicely with the Enlightenment. In that room, Thomas Jefferson commissioned artisan William Coffee to construct an entablature[i] resembling the one found in the ruins of the Baths of Diocletian in Rome, the latter a Roman emperor of the late 2nd and early 3rd centuries A.D. Like Diocletian’s entablature, Jefferson’s version included images of the “face” of the mythical Roman god, Apollo, although the Jefferson entablature also included ox skulls, something not part of the original Diocletian entablature. More on that later. There is no known record as to why Jefferson decided to re-create the entablature of Diocletian, to include its bearing the likeness of Apollo. However, during the Enlightenment, the image of Apollo was often used as a kind of metaphor representing illumination, especially the illumination of the mind through acquired knowledge and reason. As Enlightenment scholar, Professor Dorinda Outram emphasized, “Enlightened people moved as a matter of course among words and images of radiance, of sunlight, illumination, and clarity.”[ii] So did Thomas Jefferson. This brings us to the ox skulls and to Diocletian. How might these relate to Jefferson and the Enlightenment? Foremost, we do not know for certain if there is a connection. However, in Roman times, ox skulls were symbolic of sacrifice. Perhaps Jefferson’s insistent addition of ox skulls was also intended as a metaphor, something pointing to self-sacrifice in service to the nation and liberty. Finally, what about Diocletian? The answer may lie in who was Diocletian. Diocletian became emperor following a very tumultuous period in Roman history, referred to by historians as the Crisis of the Third Century. Diocletian stabilized the empire by reorganizing the administration, restructuring the military, and advancing economic reforms such as lowering taxes. Then he did something unheard of for almost any time in human history, much less during the period of the Roman Empire. Diocletian abdicated the throne voluntarily—walking away from Imperial power. In a sense, on 4 March 1809, that is precisely what Thomas Jefferson did in following the peaceful transition of power previously institutionalized by both the Washington and Adams administrations. Dave Dietrich served for over forty years as a professional national security analyst and educator at the international (NATO), national, and military service levels. Since his retirement in 2015, he has been working both as an Assistant Professor of Political Science (adjunct) and as a volunteer docent at a Thomas Jefferson historical site. Mr. Dietrich is also an occasional guest instructor at the School of Education of Johns Hopkins University (History of Intelligence). He holds a Master of Science degree in Strategic Intelligence. After Jefferson became vice-president and presiding officer of the Senate, he was concerned there were no written procedural rules to which every member could easily refer. With the initiative that defined him in so many endeavors, he began the composition of a manual of parliamentary procedure. [i] Thomas Jefferson, A Manual of Parliamentary Practice (Applewood Books, 1801), vii, from the introduction by James Gilreath, American History Specialist, Rare Book and Special Collections Division, Library Of Congress. [ii] Jefferson quoting Onslow, Speaker of the House of Commons: Jefferson, A Manual of Parliamentary Practice, 1. [iii] Jefferson, A Manual of Parliamentary Practice, 2. The Treaty of Paris in 1783 settled the claims of the Revolutionary War. It provided that “the said United States.” i.e., New Hampshire, Massachusetts Bay, Rhode Island and Providence Plantations, Connecticut, New York, New Jersey, Pennsylvania, Maryland, Virginia, North Carolina, South Carolina and Georgia, were “free sovereign and independent states.” In addition to the territory of the states, Article 2 further described the additional land west of the Appalachians to the Mississippi River as the territory of the United States. This area was known as the Old Northwest. The claims for this land had been in dispute for some time. After the French and Indian War, England issued its Proclamation of 1763 to assert dominion over this area and to prevent western migration by the colonists. Seven of the states took the position that their boundaries should be extended to encompass these lands. This claim created a dispute with the other six states, which felt that this would destroy the balance of influence and importance among the states. That after the year 1800 of the Christian era, there shall neither be slavery nor involuntary servitude in any of the said states. The ordinance was passed, but Jefferson’s prohibition against slavery failed by one vote and it was deleted. Jefferson commented that, "The voice of a single individual ... would have prevented this abominable crime from spreading itself over the new country. Thus we see the fate of millions unborn hanging on the tongue of one man, and Heaven was silent in that awful moment!" No states were formed under this ordinance and it was later supplanted by the Ordinance of 1785. The issue of having a plan for the territory became important again in 1787 when the Constitution convention did not want to deal with the issue of slavery. Jefferson was in Paris as the minister to France and did not participate in the decisions that led to the Northwest Ordinance of 1787, but his prohibition against slavery was now included for the territory north of the Ohio River. The issue of slavery was not fully resolved by the inclusion of Jefferson’s prohibition in the Ordinance of 1787. There were still Indian claims based on the guarantee of King George III that they would have the land west of the Appalachians. This was supported by the British traders who did not want the Indians displaced. The conflict eventually led to an Indian uprising under Tecumseh which was defeated by William Henry Harrison. It was not until the War of 1812 and the Treaty of Ghent (1814) that it was finally recognized as United States territory. It was not until 1865 when Jefferson’s words were included in the thirteenth amendment to the U.S. Constitution that slavery was outlawed in the United States. The states of Indiana, Ohio, Illinois, Michigan, Wisconsin, and Minnesota were formed from the Old Northwest. Lawyers, no less than others, do not want to be sued. Thomas Jefferson was greatly upset when this occurred to him and tested his legal expertise. What became a stressful ordeal for him resulted from the claim by an Edward Livingston that he owned a batture, a stretch of beach along the Mississippi River. Jefferson, as president, on recommendation of the Attorney General, had ordered Livingston removed from the property. He retaliated by filing suit against Jefferson in the circuit court in Richmond. It added to Jefferson’s concern that John Marshall, in addition to his duties on the Supreme Court, was sitting in Richmond as the Circuit Court judge. Livingston had been the US attorney in New York but while he was ill, a clerk appropriated funds from the office. Livingston accepted responsibility to repay these funds, but Jefferson would not give him time and demanded his resignation. Livingston surrendered his appointment and his property and moved to New Orleans, now in the new Louisiana Territory, to recoup his fortune. Livingston was a formidable lawyer in his own right, and Jefferson sensed that animosity was behind Livingston’s claim against Jefferson personally, so Jefferson did not hesitate to use whatever defenses were available to him. It actually ended well with Livingston obtaining some portion of the land and reviving his career. John Tyler, the District Court judge, wrote an opinion with Marshall concurring that Jefferson could not be sued in Virginia for a cause of action arising out of land situated in the Louisiana Territory. Jefferson was upset that the case did not go to trial. Still in a combative mood, he arranged for his brief to be published under the title, The Proceedings of the Government of the United States, in maintaining the Public Right to the beach of the Mississippi adjacent to New Orleans, Against the Intrusion of Edward Livingston. A number of historians who have examined this case have faulted Jefferson for his treatment of Livingston. Indeed, legal maneuverings are always open to post hoc debate, but Jefferson had acted in the office of president, and was being sued personally for damages in the amount of $100,000. Livingston may have received the batture as a legal fee, so he would have been aware that the title was in dispute. Jefferson was by now in his 70s and his legal career was four decades in the past, but his instincts remained. He approached the legal issues just as methodically as he did when a young lawyer in the General Court. Facts affirm the wisdom of Jefferson’s vision in this instance. Censoring Sullivan’s references to Jefferson would impoverish our students and faculty alike, and — as is so often the case with censorship advocates — it is premised upon ignorance. When Jefferson inherited slaves upon the deaths of his father and father-in-law, it was unlawful in Virginia to free slaves without permission of the governor and his council based upon extraordinary service. In 1769, Jefferson drafted a statute permitting manumission of slaves — a rule finally enacted in 1782. In his draft of the Declaration of Independence, Jefferson denounced King George III for having “waged cruel war against human nature itself, violating its most sacred rights of life & liberty in the persons of distant people who never offended him, captivating and carrying them into slavery in another hemisphere… ” The language was deleted to keep South Carolina and Georgia from walking out of the convention. Among his other antislavery efforts, Jefferson drafted an amendment to prevent the importation of new slaves into Virginia that was enacted in 1778 — and proclaimed that all children born to slaves in Virginia after 1800 would be born free, and “should be brought up, at the public expense, to tillage, arts, or sciences according to their geniuses… ” That radical proposal was never introduced, because the votes clearly did not exist. Jefferson wanted to have it ready, knowing public opinion would eventually change. As a member of the Second Continental Congress in 1787, Jefferson drafted rules for the governance of the Northwest Territories, Article Six of which read: “There shall be neither slavery nor involuntary servitude in the said territory, otherwise than in the punishment of crimes whereof the party shall have been duly convicted… ” If the language sounds familiar, that’s because seven decades later the authors of the Thirteenth Amendment selected Jefferson’s language to honor his courageous struggle against slavery. Today we face the sad spectacle of nearly 500 misinformed University professors and students seeking to ban the thoughts and words of Thomas Jefferson from our community. Will they demand next that the Law School remove the Thirteenth Amendment from textbooks because it embodies Jefferson’s words? Will they censor the writings of Aristotle because he, too, was a racist? George Washington owned far more slaves than Jefferson and never once spoke out publicly against slavery. Washington did free his slaves in his will, but only after he and Martha died. Jefferson did not free his slaves in his will, because he was deeply in debt and Section 54 of the Revised Code of Virginia of 1819 prohibited the manumission of slaves until creditors had been fully compensated. Freeing his slaves upon his death in 1826 was simply not a legal option. Some of the most respected American presidents of the 20th century were racists. Racism is a manifestation of ignorance, and all human beings are ignorant about many things. Some of the most visionary scientists of the ancient world were both racists and sincere believers that the Earth was flat. Should we ban their positive contributions from our schools because of their ignorance in other areas? The answer to ignorance is not censorship, but education and enlightenment. Let us not censor those who would seek to suppress the views of Thomas Jefferson, but rather subject their thoughts to the intellectual marketplace and allow each member of our community to draw his or her own conclusions in their search for the truth. Perhaps the Jefferson Literary and Debating Society would be willing to organize and host such a debate — I’ll be happy to take on the three most prominent champions of censorship, so long as I get equal time and adequate rebuttal time. Robert Turner is a Law professor and editor of “The Jefferson-Hemings Controversy.” He may be reached at bobturner@virginia.edu.